We are a leading Manufacturer of antistatic garments for automobile industries from Gurgaon, India. We offer Antistatic Garments for Automobile Industries that is manufactured using superior grade fabrics. 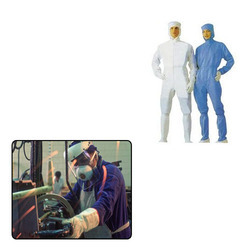 Our company has been involved in manufacturing a wide range of safety clothing such as Antistatic Garments. We have hired some of the experienced designers who help us in manufacturing and exporting Antistatic Garment.